14 pp. Roman, 235 pp. The bulk of research on codeswitching confines its scope to two languages. In this study, however, three lan­guages, Tigrinya, English and Amharic, are considered. While Tigrinya and Amharic – two Semitic languages spoken in Ethiopia – are genetically and typologically related, Tigrinya and English are distant languages both typologically and genetically. These contrasting and similar features of the languages being treated in the present study are believed to provide a point of departure for the study of codeswitching that may contribute to the further advancement of the study of bilingualism/multilingualism in general. The study considers both grammatical/structural and sociolinguistic aspects in the analysis of the data collected. It primarily investigates the linguistic or structural aspect of insertional codeswitching involving Tigrinya, Amharic and English, i.e. it explores the grammatical structure of the new bilingual constituents when linguistic items switch or more specifically are inserted into the Tigrinya utterance from English and/or Amharic. 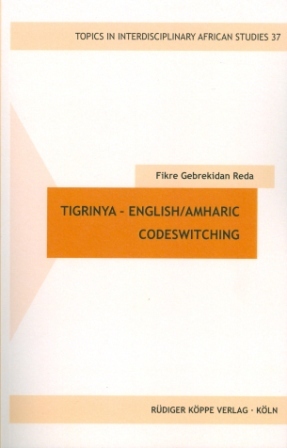 Furthermore, the book deals with social aspects of codeswitching and explores the possible pragmatic and discursive functions of codeswitching by Tigrinya speakers from Tigrinya into English and/or Amharic. Fikre Gebrekidan Reda has been lecturing at Mekele University, Tigray, Ethiopia for more than 20 years, teaching ELT (English language teaching), literature and linguistics. He did his BA degree in English at Asmara and Addis Ababa Universities, his MA degree at Addis Ababa University and his doctoral degree at the University of Oslo, Norway. His interests in linguistics include contact linguistics, particularly codeswitching, sociolinguistics and bi-/multilingualism. What is unique about this work is the fact that while most texts on codeswitching describe the phenomenon within language pairs, the author of this study takes into consideration three languages: two of them are closely related, i.e. Tigrinya and Amharic, and one genetically and typologically distant, i.e. English. Multicultural and multilingual Ethiopia is/presents a perfect field of research into bi- or trilingualism, particularly with respect to codeswitching, as most of its inhabitants are naturally predestined to speak more than one language. 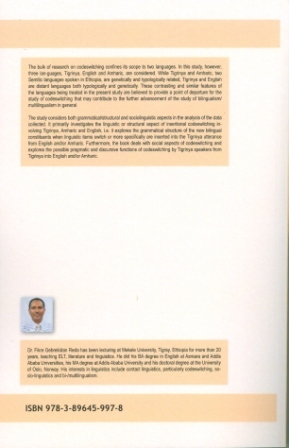 [...] The book is certainly a valuable addition based on meticulous research and extensive references, and it fills a significant gap in linguistic literature on language contact in Ethiopia. Der Autor setzt sich sehr gewissenhaft mit den behandelten Themen auseinander. Seine Ausführungen sind stets gut nachvollziehbar und die zitierte Literatur ist beachtlich. Die Wahl dieser drei Sprachen (Tigrinisch, Amharisch und Englisch) für die Erforschung des Kodewechsels erwies sich als überaus effektiv. Fikre Gebrekidan Reda ist es mit dieser Arbeit gelungen, zum einen relevante Forschungsergebnisse zur Sprachkontaktforschung und zum anderen zum besseren Verständnis der gesprochenen tigrinischen Sprache beizutragen. Dieses Buch ist daher allen an der Sprachkontaktforschung und der tigrinischen Sprache interessierten Lesern sehr zu empfehlen.